A touching science fiction romance grappling with human-scaled dilemmas, Passengers is both visually gorgeous and deeply satisfying. In the distant future, the massive spaceship Avalon is traveling in deep space to the Homestead II planet, carrying 5,000 colonists. The journey is supposed to take 120 years with the passengers asleep in hibernation pods. 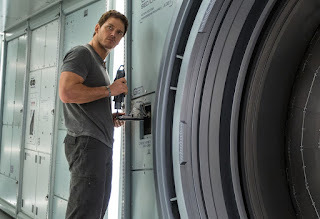 A mishap occurs when the spacecraft strikes an asteroid, and passenger Jim Preston (Chris Pratt), a mechanical engineer, is awakened 90 years early. Unable to reenter hibernation, Jim has the massive craft to himself as he faces the reality of a lonely existence and a lonelier death to come. With the android bartender Arthur (Michael Sheen) as his only companion, he drops into a severe depression. Jim becomes infatuated with young writer Aurora Lane (Jennifer Lawrence), another passenger in deep sleep. Desperate for companionship, he finally makes the difficult decision to wake her up, pretending that it's another mishap. Once she gets over the shock, Aurora and Jim do fall in love, but there is plenty of trouble ahead for the couple and all the passengers on board. Directed by Morten Tyldum, Passengers is a deep space science fiction adventure focussed on down-to-earth issues. The film soars with a rare beauty, but never loses sight of it central premise, and explores themes of loneliness, depression, and stalking. The script by Jon Spaihts ventures into the fundamental territory of the true purpose of life in the face of death, and what it means to aspire towards lofty goals only to be forced by external factors into essential, wrenching re-orientations. The film's pervasive theme is about reacting to dreams rudely knocked out of orbit. Jim's planned life is eternally altered by a technical glitch; he can only rage against the machine, an ultimately unsatisfying pursuit. Aurora is awakened by Jim, and will have to first get over the shock of a future death in space; and then confront the truth that another human had intervened in her trajectory and condemned her to a life and death she never imagined. She can rage against another human, but in the abject loneliness of space, to what end? The film looks magnificent. Rarely has space or a human-imagined space craft looked more beautiful, and the 3D imagery of the Avalon streaking through the void is awe inspiring. The vessel is cavernous, allowing Tyldum to set the action in a variety of internal locations as the universe passes by outside, and a few space walk excursions add to the diverse visual buffet on display. 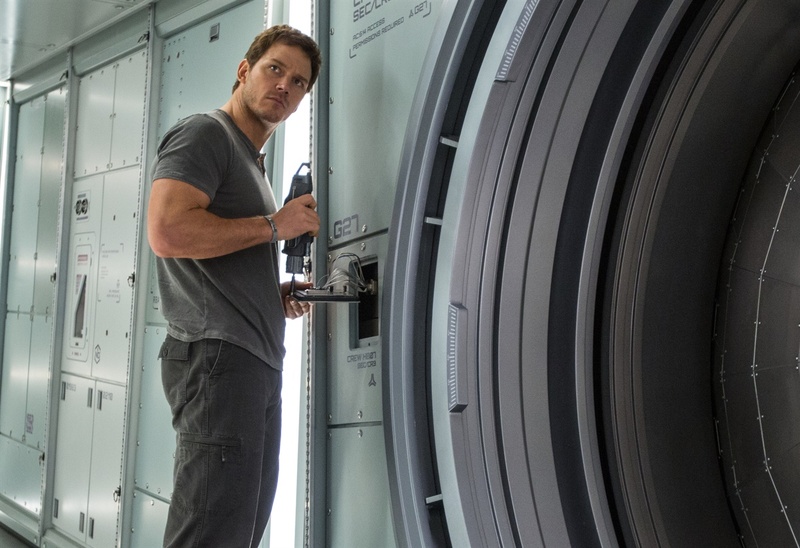 Passengers does hurtle into a bit of a technical muddle towards its climax. While the emotional build-up is superb and Tyldum hits all the high notes required for the human drama, the scientific parts of the story are jettisoned into deep space. There is a frantic rush to bang things into shape, and it's all a blur of running around, opening hatches, pointing at random items, pulling levers and putting out fires with condescendingly minimalistic explanations. 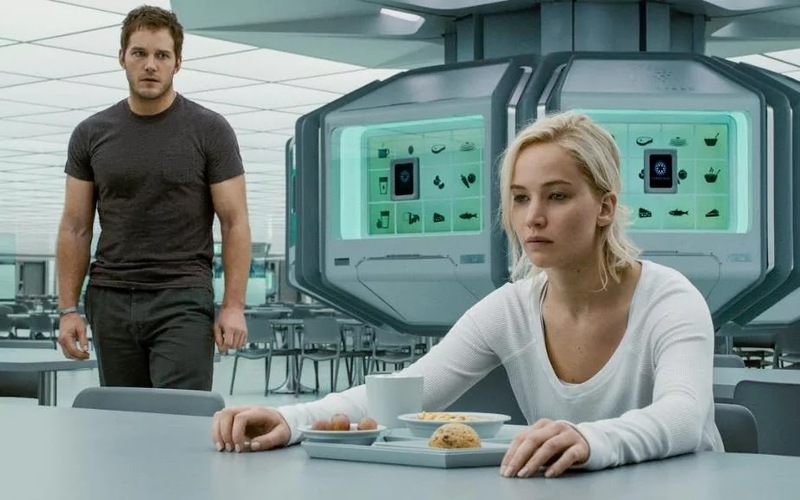 Chris Pratt and Jennifer Lawrence competently bring the two central characters to life without necessarily setting the planets on fire. They hold their own amidst all the sleek hardware, and Lawrence handles the emotional ups and down forced on Aurora with a growing maturity. Michael Sheen is ridiculously appropriate as an android bartender, while in a late and relatively brief appearance, Laurence Fishburne adds heft as a crew officer. The story of Jim and Aurora carries echoes of everyday life, where some some events appear bigger than what an individual can comprehend, while others are clearly the work of a human hand but no less impactful. Finding meaning in the here and now is never easy, and Passengers is a lyrical exploration about dealing with what is, despite what may have been.